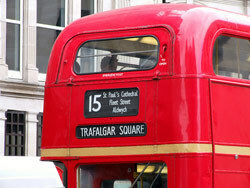 Our beloved Routemaster's retirement has taken on a melancholy air. Seeing those "heritage" routes trundle along the Strand with nary a passenger on them, a bored conductor with his ticket machine noosed forlornly around his neck, is a sad sight to behold, and a humiliating end for these once-proud beasts. The Japanese, however, aren't nearly so disrespectful to their elders. Since April a Routemaster with the number 190 displayed on its destination board has been rumbling around the city of Shimonoseki, on the southern tip of Honshu, Japan's biggest island, and is proving popular. In its first four months of operation, the bus has ferried 10,000 people between the city's station and the suburbs, with the Routemaster's double-decker profile standing head and shoulders above the low-level vantage points offered by Shimonoseki's existing fleet of single-storey vehicles. The bus - one of a half-dozen sent around the world as an elaborate calling card for London - has had a few running repairs. Around £45,000 has been spent overhauling the vehicle's innards, while an emergency exit has been added in order to comply with Japanese 'elf 'n safety laws. And, true to that spirit, hopping on and off while the bus is trundling along is strictly forbidden. Bloody killjoys. Meanwhile, the Routemaster on London's streets continues its sad decline. The competition to design a new one is still running, though, so get your entry in.